From the Fall 2014 China Glaze collection "All Aboard", was Mind The Gap, a unique olive with green shimmer inside. It reminded me a lot of China Glaze Out on Safari so I had to pull a swatch comparison with my sticks. Ooooh very close but not the same! @chinaglazeofficial Out On Safari vs Mind The Gap. MTG is from the upcoming Fall 2014 collection. For this manicure, I used a base coat of Cult Nails Get It On, 2 coats of polish and finished with Digital Nails Ain't Nobody Got Time For That. Formula was a little thin but mostly opaque in 2 coats. The green shimmer isn't as prominent in the sun as I had hoped and I'm not a huge fan of the brown on my nails but it's still a pretty unique color. But then you get in the shade and I'm a big fan! The green shimmer takes on a bit of a life of its own and starts to really push through the brown, giving a glowing look. I was much happier with this in the shade! 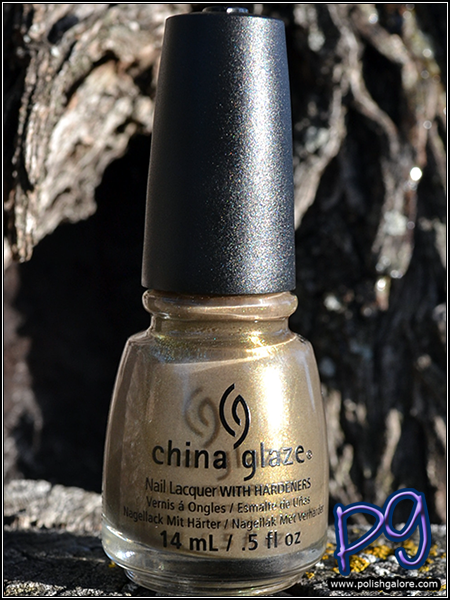 I thought this was such an interesting offering from China Glaze, I quite like it! Ooooooooh, this is such a pretty color! I really like this, and it looks great on you! I love the Mind the Gap shade. There don't seem to be that many olive golds. The comparison with Out on Safari really pointed out the difference. That is so pretty! Especially in the shade. This was one of my faves from that collection. Love it. It's a nice mature color! I wasn't too sure about this based on how it looks in the bottle, but on, it's quite pretty. Totally unique too! Yeah I was quite surprised! No kidding - rare bird around these parts! Right? Unique for their line. That's actually a great way to describe it! Yeah much better on the nail!